This week has been a bit of a disaster for my fitness. It was all going well, until I was (more or less literally) floored by period pains and then I have been suffering from what I suspect is a severe inner-ear infection, maybe labyrinthitis. I’ve had labyrinthitis before, and the perpetual dizziness and slight difficulty hearing all point towards it, but I don’t want to go to the doctor about it because they may tell me not to drive and then I can’t go to work and earn the Benjamins and that would be bad. But I don’t recommend this course of action to anyone- for God’s sake GO SEE A DOCTOR if you are worried about anything. ANYWAY- I managed to get in one workout this week, being weights and 30 minutes on the Elliptical. That’s better than nothing, but I’m hoping once I’m feeling better, after a weekend of lounging and taking it easy, I’ll be back to my regular routine. 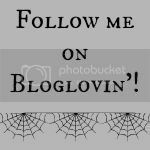 So, I figured something I could talk to you lovelies about is FOOD. I really do. That’s probably why I’m the size I am. This is my generic breakfast food- that weird brown stain on one of the eggs is crumb, by the way! 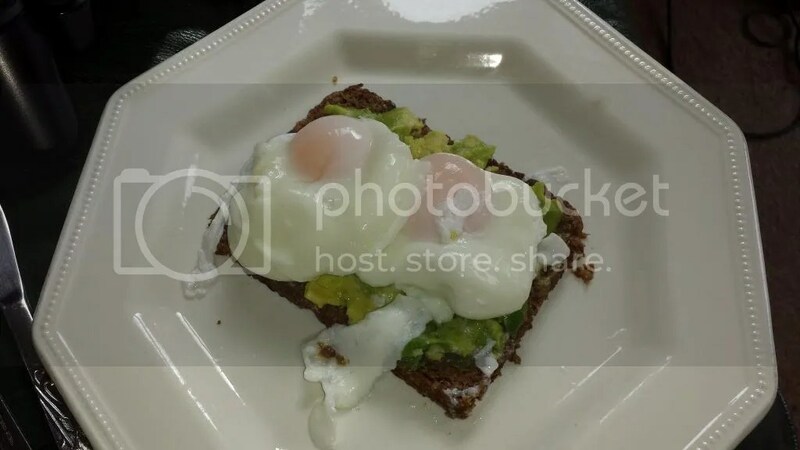 Here we have a nice piece of wholegrain rye bread, with half an avocado smooched all over it and topped with two medium poached eggs. This breakfast is around 300-350 calories, which is a perfect breakfast amount, and it’s full of fibre, complex carbs, protein and good fats that keep me quite well satisfied. I’m trying to go a bit lower-carb, or at least cut out refined carbs as much as I can, so rye bread’s not great here but I find I need something carby in the morning or I go crazy. Tell me I’m addicted and it’s sugar, I know all this but you know what? I don’t believe in cutting anything out of our diets completely, so ner. And here we have my basic dinner make up- protein source such as Quorn fillets, Lingham’s chilli sauce (OH GOD ADDICTION RIGHT HERE) and a mountain of steamed veg. I also had a pouch of frozen rice and veggies here, but usually just the vegetables on their own is sufficient. It’s an expensive way of doing things but I like to buy the ready portioned-out bags of prepared vegetables, because then I know exactly how much I’m eating and what’s in it. One of my main issues with food is portion control (as a recovering EDNOS sufferer, this is a big deal) so anything that already comes portioned out is amazingly helpful. I like to keep my carbs so I can have something fruity or chocolate or GOD FORBID cakey for pudding, om nom nom! And yes, I do eat like this pretty much every day. I’ll go for a week having poached eggs, avocado and bread for breakfast every day, then switch it up and have porridge every day the next week. I get stuck in ruts but it’s easier that way. My relationship with food is so screwed, in reality, so any normalcy or routine I can establish helps immensely. 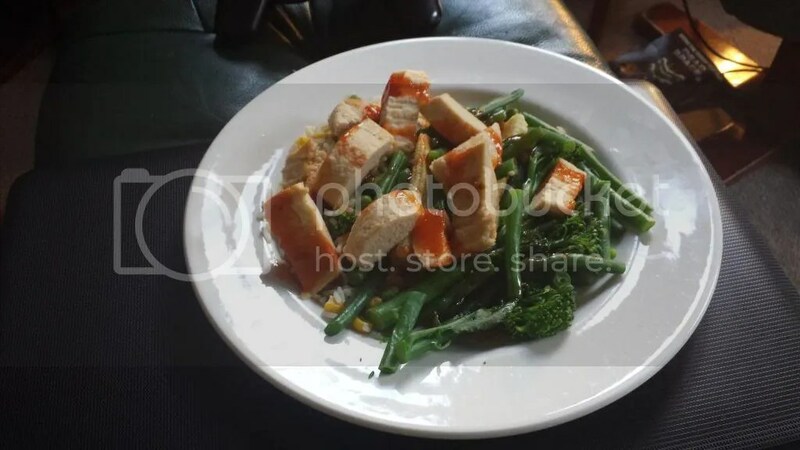 This entry was posted in Fitness Friday, Food/Recipes/Nutrition, Lifestyle, Weight/fitness. Bookmark the permalink.